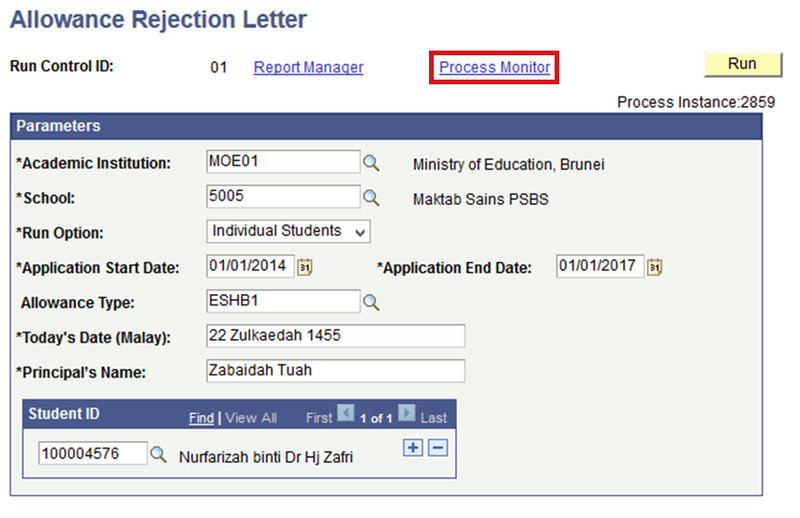 This function allows the users to create Rejection Letter for unsuccessful applicants. Navigate to Main Menu > Student Financials > Student Allowances > Allowance Rejection Letter. 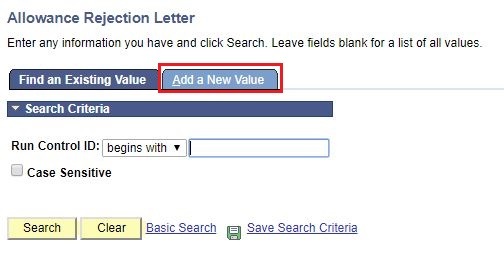 On the page, Click on “Add a New Value” tab. 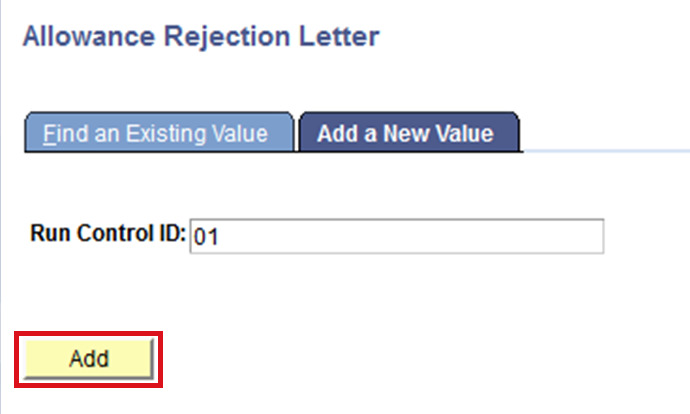 In the Add a New Value section, enter any value in the Run Control ID field and click on the Add button. You will be directed to the Allowance Rejection Letter page. Enter the values in the Academic Institution, School, Application Date, Application End Date, Todays Date (Malay) and Principals Name fields. School: enter the school campus code. For e.g. “1012”, “3001”, “5003”. 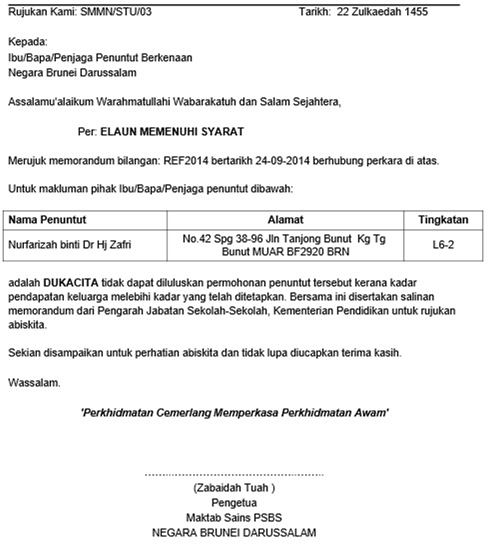 Application Start Date:	Enter the start date of the allowance application. Application End Date: Enter the End date of the allowance application. Allowance Type: Enter the type of allowance here. For e.g. “ESHB1”, “HSTPK” and “BUSB1”. Today’s date (Malay): Enter the Malay date here. For e.g. “Rajab 19, 1440”. Principal’s Name : Enter the name of the school principal here. Select a value from the Run Option field. Choose Individual Student to create a letter for a single student. Choose All Students to create letters for a group of rejected applicants. All Student: the option to select all student that fall under the parameters entered in the other fields. 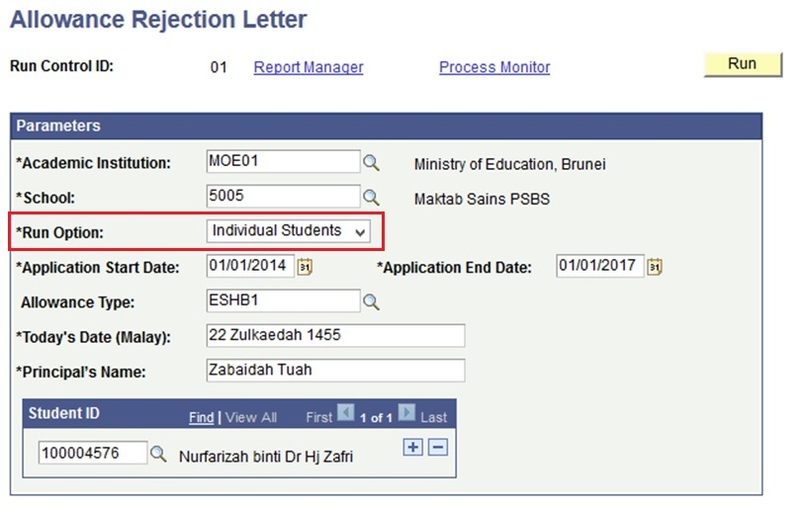 Individual Student: Option to select individual student/s to have their rejection letters made. Enter student ID in the field or click on look up button to look up the student. Click on the “+” button on the right to add additional student/s. Click on the “-” button next to “+” to remove the current student ID. You will be directed to Process Scheduler Request page. Choose the Allowance Rejection Letter process by selecting its checkbox. You will be directed back to the Allowance Rejection Letter page. Take note of the Process Instance number generated. 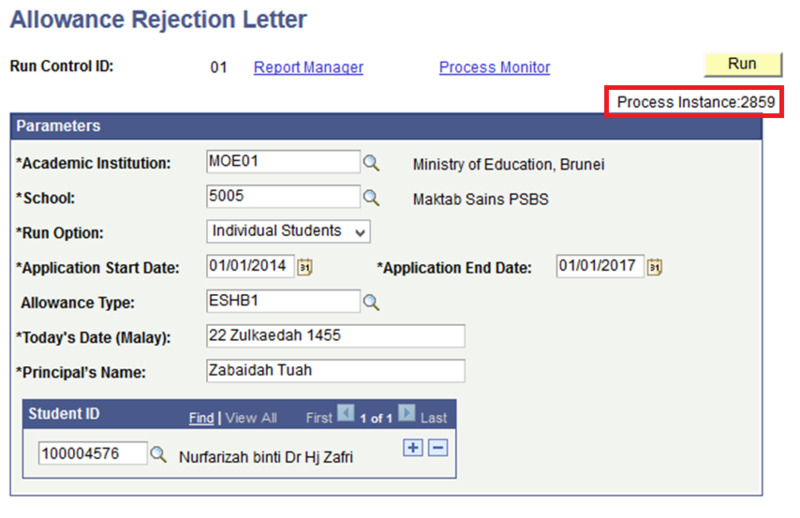 Click on the Process Monitor link to check the status of the process. 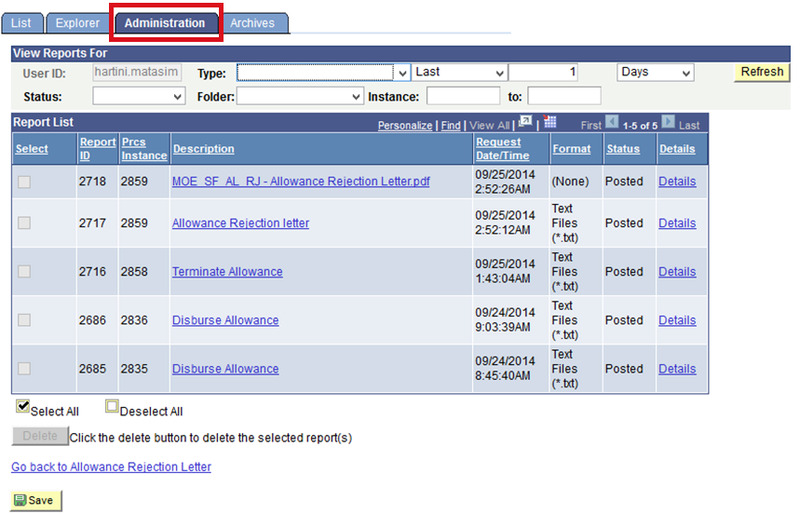 Click on the Refresh button till the Run Status is set as Success and Distribution Status is Posted. Click on the Go back to Allowance Rejection Letter link. You will be directed back to Allowance Rejection Letter page. 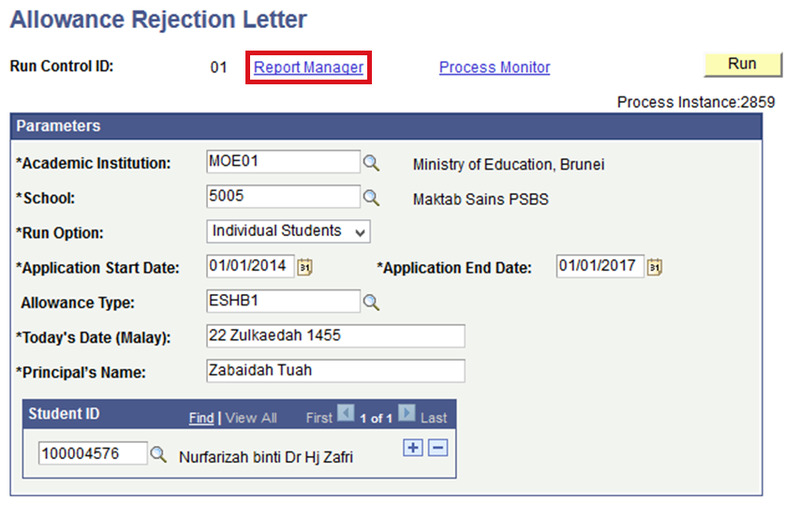 Click on the Report Manager button. Click on the Report link. You will be directed to Report Detail page. 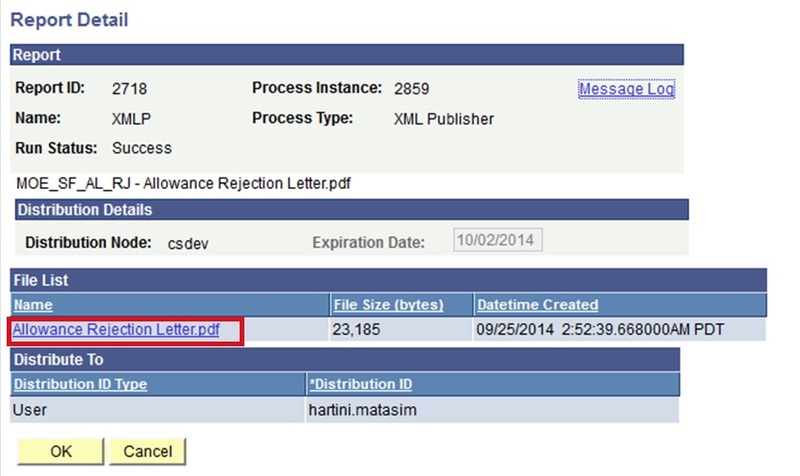 Look for your process instance number and click on the .pdf file generated. 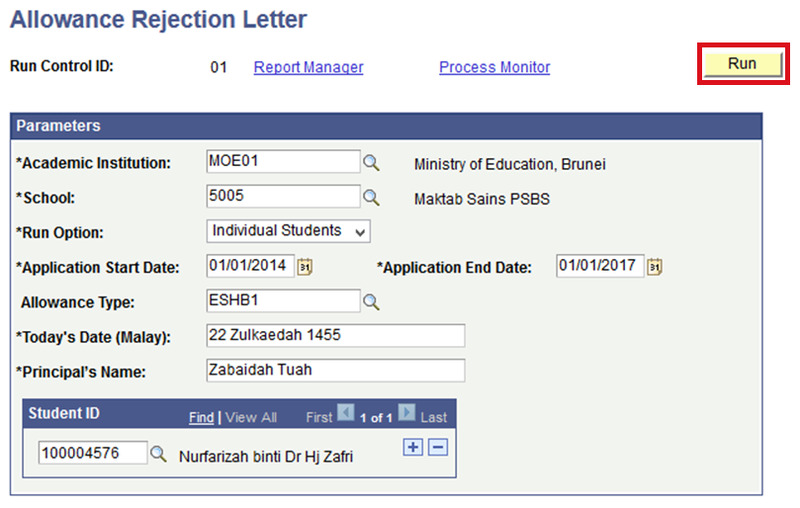 Note: You will be able to see the generated Rejection Letter.